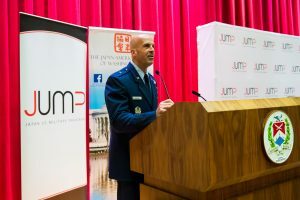 JUMP Reception at the National War College on November 16, 2017. Distinguished specialists on Japan, China, the Korean Peninsula, and U.S.-Northeast Asian relations discussed the persistent challenges that have and continue to impact the region at a special JUMP event held at the National War College on November 29. This was followed by dinner and a reception . The event was hosted by the Japan-America Society of Washington D.C., the National War College, and JUMP with support from Sasakawa USA, the National Association of Japan-America Societies, and the Embassy of Japan in the United States.